For two innings, it was a scoreless game. The Mets then scored in each of their next six innings (first time since 2005) and coasted. Having won two of the first three, the Phillies had a chance to win a series on the road for the first time since July 2-3-4 in Pittsburgh. Instead, they are faced with trying to do that in Chicago this weekend. Ethan started and allowed only one run through three innings. He finished allowing three in four total innings. Yet he struck out a career-high nine. In 25.1 big league innings, he’s given up 18 runs but fanned 32. Three other Phillies bullpeners followed him to the mound and none had a scoreless outing. The loss ensured a losing record for August, their third straight month under .500. Hard to believe but the last official weekend of summer is here. All season, weekends have been a nightmare for the Phillies: Friday 10-10, Saturday 6-16, Sunday 10-11. A bad omen: Phillies are 386-474 since Wrigley Field opened in 1916. **Lehigh Valley lost, 9-2, at Scranton, getting 7 singles and 1 double. **Reading edged Richmond, 9-8, scoring the winning run with 1 out in the bottom of the 9th on a wild pitch. LF-1B Jim Murphy, 4-5, including 22nd HR. 1B-3B Maikel Franco,2-5, 15th HR; 31st overall for the season. **Clearwater was shut out for the 3rd straight game, this time, 8-0, at Dunedin. The Threshers have a consecutive scoreless streak of 25 innings. **Lakewood lost, 14-1, at Hagerstown, allowing 7 unearned runs (3 errors, 2 passed balls). Lakewood pitchers walked 12. DH Willia Carmona, 33rd-34th doubles. **Williamsport lost a suspended game, 7-5, and won the regular game, 6-5, on six hits, 4 walks, 3 Batavia errors and 1 passed ball. **Gulf Coast League Phillies ended season with a 1-0 loss at the Pirates. Club finished the season at 30-30 after starting 4-11. August 30, 1913–With the Phillies leading, 8-6, in the top of the ninth inning, Baker Bowl fans in one bleacher section began to distract New York Giant batters by waving handkerchiefs, newspapers and straw hats. Umpire William Brennan forfeits the game to the Giants. NL President Thomas Lynch overrules Brennan and declares the Phillies the winners. New York appeals and the NL Board of Directors rule the game to be completed in New York on October 2. Phillies win, 8-6. August 31, 1979–Farm director Dallas Green replaces Danny Ozark as the Phillies manager. Ozark finishes with a 594-510 record for six-plus seasons. August 31, 1983–LHP Al Holland picks up his eighth win out of the bullpen, 4-3, over visiting San Diego. Pirates, Phillies, Expos and Cardinals are in the race as September 1 rolls around. Difference between first and fourth place is two and a half games. August 31, 2006–1B Ryan Howard hits 49th home run to break Mike Schmidt’s single-season record (48 in 1980) during a 6-5 loss at Washington. September 1, 1945–CF Vince DiMaggio sets a club record and ties the NL mark with his fourth grand slam of the season in an 8-3 win at Boston. September 1, 1980–Having watched the Phillies bounce back and forth most of the season between second and third place, angry GM Paul Owens ripped into the team in a stormy clubhouse meeting in San Francisco. Phillies beat the Giants, 6-4, launching a streak in which they won 23 of their next 32 games and their fourth NL East title in five seasons. Cole has found his groove. He picked up the win last night and singled in a pair of runs. In six August starts, he’s 2-0 with a 2.00 ERA, 4 walks, 38 strikeouts in 45 innings. His 2.70 career ERA for this month is the lowest for any month. In his last 11 starts, which includes five in July, he’s 4-2. He’s allowed two of less runs nine times. Hard to believe he had all those struggles the first three months of the season. Win was Phillies eighth in their last 11 games and sets up a possible series win on Thursday afternoon. After Thursday, Phillies head for Chicago and homecoming for Ryne. All three games in Wrigley Field are day games. Pitcher – RHP, Mark Leiter, Lakewood… 2 starts… 1-0, 0.00 ERA (11.0 IP), 8 H, 0 R, 0 ER, 2 BB, 12 SO… Earns POTW honors for the 1st time this season… Leiter was drafted in the 22nd round of this year’s draft out of the New Jersey Institute of Technology. He’s the son of Mark Leiter who pitched for the Phillies (1997-98). Player – 2B, Andrew Pullin, Williamsport… 7 G… Batted .400 (12-30), 2 R, 4 2B, HR, 5 RBI, 1 BB… Pullin earns POTW honors for the 2nd time this season (7/8-14)… A 5th round selection in the 2012 First-Year Player Draft out of Centralia HS (Washington), Pullin was signed by Rick Jacques. **Lehigh Valley lost, 5-4, in 12 innings at Scranton. 2B Cesar Hernandez, 2-6, boosting average to club-high .317. Season ends Monday. **Reading lost, 1-0, to Richmond. 3B Maikel Franco, 2-4, boosting average to .332. LP: Jesse Biddle (5-14), 3 IP, 1 H, 1 R, 7 BB, 4 SO. Season ends Monday. **Clearwater was blanked twice at Tampa by the same 2-0 score. Threshers had 15 hits in the DH but were only 1-17 RISP. LF Aaron Altherr, 3-4, in 2nd game plus 23rd steal. Season ends Sunday. **Lakewood was defeated, 4-2, in Hagerstown, getting only 3 hits. 3B Willie Carmona, 6th HR. Season ends Monday. **Williamsport scored 7 in the 2nd inning to cruise, 9-1, at State College. 3 RBI: Gustavo Martinez. WP: Yacksel Rios (5-2). SV: Felix Santos (3). Season ends Sept. 4. **Gulf Coast League Phillies won, 7-4, vs. Pirates in final home game. 3 RBI: 2B Robinson Torres, DH Wilmer Oberto. 1B Trey Williams, 3rd HR. Final game 12 noon today in Bradenton (Pirates). August 29, 1885–RHP Charlie Ferguson tosses the first no-hitter in Phillies history, 1-0, vs. Providence. In his four-year career, all with the Phillies, he finished 99-64, 2.67 ERA winning 21-26-30-22. He died of typhoid fever two weeks after his 25th birthday. There’s been no middle of the road for KK this season. He’s either very good or struggles. When allowing two or fewer runs, he’s outstanding. Been that way for 12 starts. For the other outings, not so good. Last night, a walk to the enemy pitcher (Niese) led to the first run. Next time up, Niese cleared the bases with a double, his first extra-base hit of the season. An error helped lead to that four-run inning. Of the five runs KK allowed, just one was earned. On the mound, Niese was equally tough, shutting out the Phillies for the fourth time in their last 16 road games. For the season, it’s the 13th time they’ve been blanked. Cheer up. Most times Phillies have been shut out in their history, 23, in 1908 and again in 1909. Terrific Tuesday fell to 12-8, setting the stage for woeful Wednesday (6-14). Time to make it wonderful Wednesday. **Lehigh Valley handed Buffalo a 5-3 loss. RH David Buchanan (4-1) allowed 3 runs in 1st 2 innings and then blanked the Bisons though 7 innings. LH Mauricio Robles, 7th SV. 2B Cesar Hernandez, 32nd steal. CF Derrick Mitchel, 2B, 4th HR. **Reading won a 9-8 wild one vs. Richmond. Fightin’ Phils scored 6 in the bottom of the 2nd only to see Richmond take the lead with 6 in the top of the 9th. 1B Jim Murphy hit a 2-run, walk-off HR in the bottom of the 9th, his 22nd HR and 3rd hit of the game. Kelly Dugan won Monday’s game with a walk-off HR in the 10th. **Clearwater nipped Tampa, 2-1, in one of the strangest games of the season. Threshers were held to 1 hit (Peter Lavin 1B in 1st inning) and won the game by scoring 2 runs in the bottom of the 9th on 4 walks and a SF by 3B Harold Martinez. **Lakewood won its 4th in a row, 6-5, at Hagerstown. 1B Art Charles hit a 3-run HR in the 1st inning. **Williamsport lost, 5-3, in 11 innings to State College. No decision Drew Anderson, 5 IP, 2 H, 6 SO. 2 hits: 2B Zach Green, C Andrew Knapp, 1B Logan Pierce, SS Jairo Cardozo. **Gulf Coast League Phillies lost, 8-2, to the Yankees. 2B Robinson Torres had 2 hits, giving him 6 in last 14 ABs. SS Jair Morelos, 19-year-old, stretched hitting streak to 5 games (6-18). Two more games left on the schedule. **2B Cesar Hernandez and 3B Cody Asche have been selected to the International League postseason All-Star team. **Phillies are sending 7 prospects to the Arizona Fall League: OF Kelly Dugan, C Cameron Rupp, OF Aaron Altherr, RHP Ken Giles, RHP Michael Nesseth, RHP Kyle Simon and LHP Austin Wright. August 28, 1971, 2nd game–RHP Rick Wise (14-10) hits a solo home run in the fifth inning and a grand slam in the seventh in defeating San Francisco, 7-3, in the second game of a Vet Stadium doubleheader. It is Wise’s second two-home run game of the season, tying a major league record for pitchers. Past Profile on http://www.phillies.com/alumni features the 1923 Phillies who led the NL in homers but lost 104 games. Check out the vintage team photo from spring training 90 years ago. Cliff was masterful and Cody came through with his first big league triple enough to give the Phillies a 2-1 win in New York last night. Going into the game, the Phillies were 1-13 in their last 14 road games. This season has been filled with “believe it or nots”. The win for Cliff was his first since July 5 in seven starts, believe it or not. From Elias: Lee has now won a major league-high six games this season in which his team scored three or fewer runs. Cody’s certainly showing promise for the future with his bat and glove. His game-winning hit came with two out. Cody started 1-17 but has rebounded. How rare was the 2-1 win? Well, when scoring three runs or less, the Phillies have been dreadful, 15-53, to be exact. When scoring four or more, 45-18. That’s the story of the 2013 season in a nutshell. The win was the seventh under Ryne, six being one-run decisions. **Lehigh Valley, after four games in Buffalo returned home to face the same team for three games, including a DH last night . . . Buffalo won the opener, 5-2. 2B Michael Martinez, 3rd HR; Cesar Hernandez, back in CF, 2-3 . . . Fredd Galvis’ single capped a 2-run 7th inning that gave LV a 3-2 win in the 2nd game; Freddy was 3-4. Reading closer, Mike Nesseth, started for LV, 4 IP, 1 H, 2 SO. **Reading rallied for a 7-6 win over Richmond. 1B Maikel Franco tied the game with a 2-out, 2-run HR in the 9th (30 for the season) . . . RF Kelly Dugan won game with a lead-off, walk-off HR in the 10th (20 for the season). **Clearwater lost, 8-5, to Tampa. DH Chris Serritella,12th HR . . . LF Peter Lavin, 3-4. **Williamsport cruised to a 13-5 win over State College, getting 17 hits. C Andrew Knapp, 4-5, 3 2B . . . CF Herlis Rodriguez, 3-5, 3 RBI . . . RF Dylan Cozens, 3-5 . . . 2B Andrew Pullin extended hitting streak to 8 games. **Gulf Coast League Phillies defeated Yankees, 8-6. C Devi Grullon, 3-3, 2 RBI. After starting season 4-11, Phillies have gone 25-17. Three more games to go. Happy birthday to RHP Don Grate, 90 today. He was 0-1 in 1945 and 1-0 in 1946 with the Phillies, his lone big league experience. 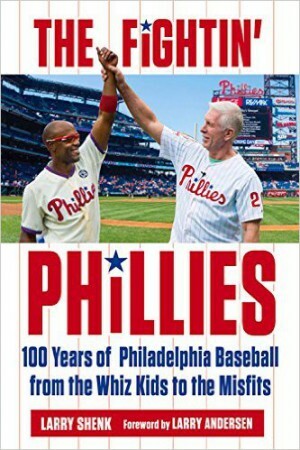 He becomes the seventh Phillies Alumnus 90 years or older. Oldest is SS Alex Monchak, 96. What a weekend to cap Ryne’s first 10 games as manager. Friday was a third straight walk-off win, Saturday a historic marathon loss and Sunday a welcome back win for Doc. **The game’s first pitch came at 7:06 p.m. The game ended 7 hours and 6 minutes later. **By the clock, it was the longest game in Phillies history. Previous was 6 hours, 15 minutes, a 7-6 loss to the Orioles, July 2, 2004. Chase was 0-1 as pinch-hitter in that game. J-Roll, 3-5, playing the entire 16-inning game. **So, 9-year-old Citizens Bank Park has hosted the two longest games. Sorry Baker Bowl, Connie Mack Stadium and Veterans Stadium. **Two teams combined for 137 at-bats, 35 hits, 32 strikeouts and 28 walks. **Two teams used 20 pitchers, tying a major league record. **Combined, the pitchers threw 712 pitches. Home plate umpire Clint Fagan must have seen pitch after pitch in his sleep. **Ten Phillies relievers worked a total of 17.1 scoreless innings, a club record. **Two of the 10 were position players, OF Wells and INF McDonald. Last time the Phillies used two position players on the mound was an 8-5, 9-inning loss to the Cubs in Wrigley Field on July 22, 1945; 1B Jimmie Foxx (2 IP) and OF Rene Monteagudo (4.1 IP). “You never know what you’re going to see in the game of baseball,” Ruf. “Surreal is a good word for the whole night, in general,” Wells. Meanwhile, Doc was sleeping in a Reading hotel expecting to make a rehab start on Sunday for the Fightin’ Phils. He had no idea what was happening in Philly. He was awoken by Ruben, asking him if he was willing to pitch Sunday at Citizens Bank Park. Doc is always willing to take the ball. Around 12 hours after the marathon game ended, Sunday’s game was scheduled to begin. A short night of sleep and pack for a road trip. Players were told they didn’t have to report until 12 noon. Batting practice was optional indoors. Team left after Sunday’s game for New York and a four-game, four-day series with the Mets that starts tonight. Then, a weekend in Chicago before returning home Labor Day to face the Nationals. **Lehigh Valley lost 2 of 3 at Buffalo. Cesar Hernandez returned to 2B after playing CF. RF Steve Susdorf, 3-5, 2nd HR, 3 RBI, 11th steal on Sunday. **Reading split four games against New Hampshire. LH Jesse Biddle (5-13) tossed 6, 1-run innings in Friday’s win. Big Saturday news: 3B Maikel Franco made a start at first base. He’ll finish the season playing 1B. He hit his 13th AA homer in Saturday’s first game. **Clearwater won 2 of 3 against Lakeland. LH Hoby Milner (12-6) won on Saturday. LF Aaron Altherr, extended his hitting streak to 9 games, 15 hits including 3 doubles (36), 12th homer, 7 RBI, 21st steal. He has 4 consecutive 2-hit games. **Lakewood swept 3 games from Delmarva. SS J.P. Crawford is hitting .321 in his first 8 games after promotion from Gulf Coast League. **Williamsport lost 2 of 3 to Jamestown. 2B Andrew Pullin has a 7-game hitting streak that includes 4 doubles, 1 HR, 5 RBI. RF Dylan Cozens’ 8-game streak ended Sunday. 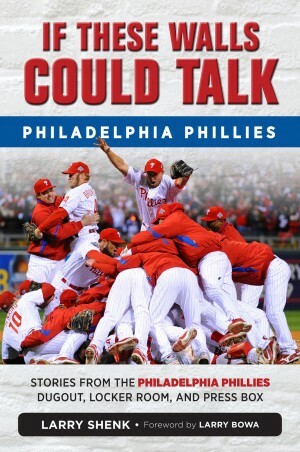 **Gulf Coast League Phillies lost 2 to the Blue Jays, 1-0, each game. Season ends Thursday. Check out http://www.phillies.com/alumni for a behind-the-scenes feature on Alumni weekend held earlier this month. Included is a terrific photo of Schmidt, Bowa, Bull and Boonie. Phillies Insider is taking a summer vacation break. Will return on August 26. Charlie is no longer the Phillies manager, but he will be remembered forever. To me, Charlie and Danny Ozark had similarities. Both weren’t popular hires, both were considered players’ managers, both were loyal to their players, both didn’t criticized players publically, both could air out players behind closed doors, both won division championships, both had long tenures that ended during disappointing seasons. There is a difference, however. Danny won three straight division titles but couldn’t get the club to the next level, the World Series. We all know Charlie’s accomplishments. It will be a long, long time before some puts up better numbers and more championships. Hey, the only Philadelphia baseball manager to win more games than Charlie was Connie Mack, who managed the Philadelphia A’s for 50 years. With the addition of Pete Rose in 1979, a World Series appearance was expected. Instead the team stumbled and finished fourth and Danny didn’t finish the season. Dallas Green came down from the front office in late August and guided the Phillies to their first World Championship the next season. It was time for Danny, a very nice person, to go. Things became stagnant with an older club. It has been my experience once a manager is around for six or more seasons, their methods, their voices no longer seem to matter. It isn’t the fault of the manager or the players, it just happens. Gene Mauch and Jim Fregosi went through the same thing. And, now Charlie joins the list. High expectations with a veteran team went down the tube since the All-Star Game. Every season under Charlie, the Phillies excelled in the second half. Not this year. Offensively, the Phillies have struggled all season. Charlie takes pride in knowing and teaching hitting. Something wasn’t clicking anymore. The end was coming and Ruben felt now was the time. Surprised? Yes. Shocked? No. Once a GM makes a decision, then a change is needed. It would have been worse for Charlie to hang around the rest of the season. There is no ideal time to change managers or an easy way to do it. But, life and the game continue. When Charlie was hired, fans and media were rough on him…he didn’t know how to manage, he was “good old Charlie”, a guy who stumbled over words and got mixed up with his comments. Slowly, everyone began to realize Charlie knew baseball. He had a lot of qualities I’ve never seen among the 17-some managers I rubbed elbows with. Most amazing to me was that he never panicked and was always positive. That’s damn hard during a 162-game season. Some day, he will be honored by the Phillies and fans will get to express their appreciation for a person who attained the status of a rock star. We were privileged to be around this humble man. Thanks for the ride, Charlie. Phillies began the year going 15-15 in their first 30 road games. After last night, they’ve dropped 24 of their last 33 away from home. Atlanta had only lost two series at home but the Phillies couldn’t make it a third. After a day off today, 25 of their next 35 games are at Citizens Bank Park where they are 29-27. That mark includes a 3-6 stand in their last homestand. A 10-game homestand starts Friday night. The hottest team in the NL, the Dodgers, are the weekend visitors. Phillies lost three of four in LA to close out June. The Dodgers were in last place then, 38-43. Since then, LA is 32-7 and riding the majors’ longest winning streak, eight straight. **Lehigh Valley defeated Syracuse, 4-1, behind a complete-game, 3-hitter by Tyler Cloyd (5-9). In last 7 starts, 4-1, 1.34 ERA. **Reading was edged by Binghamton, 4-3. 3B Maikel Franco, 2-2, RBI; boosted average to .345. **Clearwater split a DH at Daytona for the second straight day, 5-1 loss and 2-0 win as 3 pitchers combined on a 7-inning, 2-hitter. WP: Luis Paulino (5-6). SV: Ken Giles (5). **Lakewood lost, 10-2, at Kannapolis. DH Willie Carmona 1-5 to stretch his hitting streak to 8 games. **Williamsport lost its 6th in last 7 games despite allowing only 4 hits, 3-0, to Auburn. **Gulf Coast League Phillies lost, 5-0, at the Pirates. 3B Robinson Torres, 2-4; hitting .367 in last 10 games . . . Roy Halladay takes to the Carpenter Field mound at noon today in a rehab start. A lot of eyes will be focused on Doc. How have the fortunes of the Phillies and Braves changed? Atlanta’s win last night kept them from losing back-to-back games for the first time since July 3-4. For the Phils, it was their chance to win two straight for the first time since July 14 and 19. Following their win on July 14, the Phillies were 6.5 games behind the Braves. Now, 19.5. Atlanta is 19-10 against the Phillies since the start of the 2012 season. From 2008 through 2011, the Phillies held a 44-28 edge. Four rookie pitchers kept the Phillies in the game last night but the offense could only produce a run on six hits. In their last 22 games, the Phillies have scored one or fewer runs nine times. Pitcher – RHP, David Buchanan, Lehigh Valley… 1 start… 1-0, 0.00 ERA (7.0 IP), 6 H, 1 R, 0 ER, 0 BB, 1 SO… The 24-year-old Buchanan was selected by the Phillies in the 7th round of the 2010 First-Year Player Draft and signed by Ellis Dungan. Player – SS, J.P. Crawford, GCL Phillies… 7 G… Batted .417 (10-24), 6 R, 2B, HR, 7 RBI, 5 BB… The 14th overall selection in the 2013 First-Year Player Draft, Crawford leads the GCL in batting (.377 AVG) and OBP (.469)…21 BB to only 19 SO on the season. **Reading rallied for 2 in the 9th and a 7-6 win over Binghamton. LF Anthony Hewitt singled with the bases loaded to tie the game and the winning run followed on a wild pitch . . . C Sebastian Valle, 3-5, including 2 doubles . . . CF Zach Collier, 2 triples . . . No decision: Jesse Biddle, 6 IP, 5 H, 2 R, 3 BB, 9 SO. **Clearwater split a pair at Daytona Beach, 5-0 loss followed by a 3-2 win. Threshers had just 10 hits in the DH . . . RF Cameron Perkins, 6th HR in 2nd game . . . WP: Mark Leiter (1-0), 1 R, 5 IP . . . SV: Colton Murray (11). **Lakewood lost, 12-8, at Kannapolis as both teams had 11 hits. DH Willie Carmona was 1-5, stretching his hitting streak to 7 games. His .303 average leads the club. **Williamsport on 2-day All-Star Game break. **Gulf Coast League Phillies defeated Yankees, 9-7. DH Wilmer Oberto, 4-4, including 9th 2B; 1 RBI, 41 for season in 36 games; hitting .412 in last 10 games, boosting season average to .350 . . . 2B Jair Morelos, 2 2B, 2 RBI . . . WP: Denton Keys (2-1). Cole, Cody paved the way for Charlie’s celebration. Winning for the first time in Atlanta in over two seasons, Cole also ended the Phillies 11-game losing streak on the road last night. He not only tossed his first complete game of the season but got the second triple of his career and scored the first run. Cody made a brilliant play in the field, hit a crucial three-run homer, singled, stole second and scored the fifth run. #25 plays like #26. The win made Charlie the 59th manager in baseball history to win 1,000 games, quite an accomplishment. In typical fashion Charlie gave all the credit to the players in his post-game quotes. That’s Charlie, who will wind up as the greatest manager in Phillies history. It will be a while before someone exceeds his accomplishments. Some day, Charlie will be the fifth manager in the Toyota Wall of Fame at Citizens Bank Park, joining Paul Owens, Larry Bowa, Gavvy Cravath and Dallas Green. Yet, the Baseball Writers Association of America has never elected Charlie as a Manager of the Year. Puzzling. Note from Vince Nauss, former PR assistance: Among managers in winning percentages, Charlie’s .548 ranks 20 among managers with 10 or more seasons. **Lehigh Valley’s 3-game winning streak ended, 5-4, at Gwinnett. RF Steve Susdorf, 2-4, .329 season average. **Clearwater was held to 4 hits in losing, 4-0, at Lakeland. **Gulf Coast League Phillies beat Yankees, 6-2. 3B Robinson Torres, 2nd HR, 3 RBI. CF Herlis Rodriguez, 2-3; hitting .395 in last 10 games. SS J.P. Crawford, 2B, RBI, 11th SB; hitting .417 in last 10 games. August 13, 1939, 1st game–RHP Wayman “Bill” Kerksieck has the dubious distinction of setting a club record by allowing six home runs (in four innings) in an 11-2 loss to the Giants at New York. August 13, 1972–Between games of a Sunday afternoon doubleheader with Montreal, high-wire artist Karl Wallenda thrills the crowd of over 30,000 by walking across the stadium on a tightrope, the most dazzling promotion in Vet history. He repeats the nerve-wracking feat on May 31, 1976. For Alumni news, notes and photos, visit http://www.phillies.com/alumni.